I may be a slow learner. It occurred to me yesterday that in spite of the popular rhetoric about battling cancer, being a warrior and fighting the good fight, I am not fighting against a foe. Rather, I am fighting for the ability to live my life the way I choose. At Stage IV for over six years now, it is preordained by those with medical degrees that I cannot be cured and cancer will eventually win in the form of an earlier than expected death. Kate and Sheryl, sharing education at Johnson’s space center in White Sands Test Facility , New Mexico. Since I cannot change the outcome, I am left with making the daily choice of how to use the energy and time remaining to me. Cancer treatments temporarily beat the cancer cells, but the cells always find a way to outsmart the treatments. The collateral damage done to the physical body is cumulative. The collateral damage done to the social emotional self is no less harmful. As time continues, those in your acquaintance are necessarily compelled to attend to their own affairs. Our longevity is deceiving as it gives the appearance that we can continue to live with cancer indefinitely. But those of us fortunate enough to have slow moving cancer that responds to most treatments will continue to experience changes that are debilitating to varying degrees. We will continue to cope (or not) with having a terminal disease while not yet being terminal. What we are left with is a choice of how we want to spend each day. Do I have enough energy today to _________? Will my physical self cooperate with a desired activity? Will travel interrupt my treatment schedule and will that interruption give cancer the upper hand? Can I handle being with others emotionally? Can my friends treat me the same as before cancer, or will they only ask about the beast that inhabits my body? I am not a warrior fighting a battle against a foe that I cannot beat. I am fighting to be as “normal” as I can. Cancer may consume much of my time and insert itself into my consciousness unwillingly. But when you meet me, try to remember that I am much more than my disease or the dysfunction it causes. My cancer sister’s and me are incredibly talented women with much to offer. 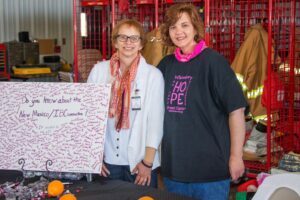 Katheen Strosser, a retired Associate Professor at Edinboro Univesity of PA. Kate has been living with Stage IV Inflammatory Breast Cancer since April, 2009. Kate is hopeful that continued research will find an answer to stop the metastatic process and allow her to spend many more years with her children and grand-daughters. We wanted to share a favorite picture of Kate, with another inspiring IBC sister, Sheryl. Both living life as best they can and making the most of each day.